This is also the first time US troops will have been stationed right on Russia’s borders. It is a great concern and is part of the US buildup of empire, says Elsa Rassbach, German affiliate of War Resisters International, Code Pink. NATO's anti-Russia exercises are being ratcheted up with Germany announcing it would deploy tanks to Lithuania. 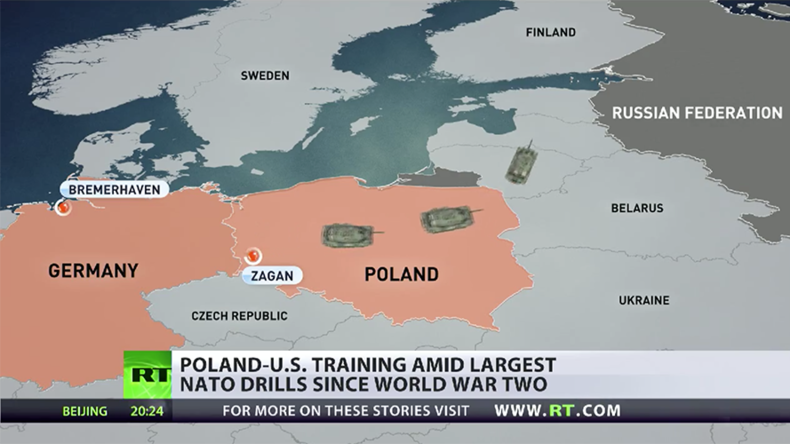 Earlier this week, joint US-Polish military training with 3,500 American troops kicked off in Poland. The German command said it was sending about 200 military vehicles, including 30 tanks and 450 troops. The movement of forces, which started on Tuesday, will continue until late February, it said. 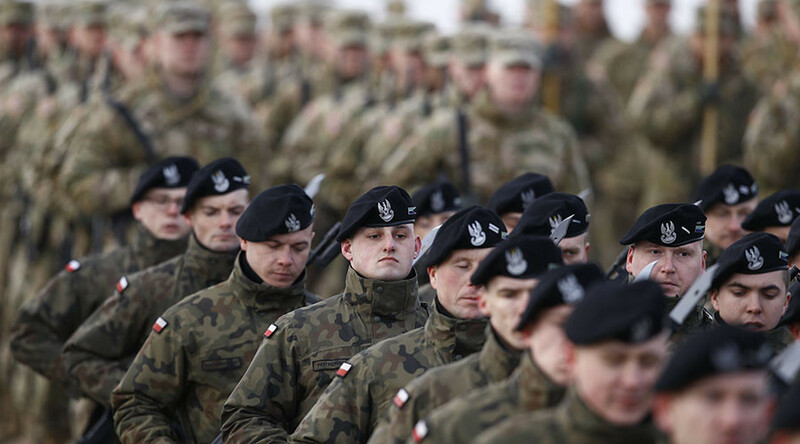 RT: Approximately 3,500 American troops have been deployed to Poland marking the first time since World War II the US has sent soldiers there in such numbers. Why such a strong presence on Russia’s borders? Elsa Rassbach: This is also the first time US troops will have been stationed right on Russia’s borders. It is a great concern. The reason given by NATO and many Western politicians is that they claim Russia has aggressive intentions; they cite the conflict in Ukraine; they cite Crimea, and they say the states, such as Poland and the Baltic countries are concerned about Russian aggression. They want to show that Russia would not be able to succeed with such aggression, if Russia tried to do so. I haven’t personally seen any evidence that there has actually been an attempt by Russia, or even any plan by Russia to invade any of those states. I see this more as part of the US buildup of empire and trying to become the only force in the world that can tell all other countries what to do. That is how I see what is happening. RT: NATO says the campaign is aimed at deterring Russian aggression in Eastern Europe. What aggression are they talking about by deploying troops in Lithuania or Poland? ER: As I said, I don’t think there has been any evidence of aggression directed to those countries. When they cite Ukraine – that is a complex situation, where the EU proposed a trade agreement – this was in line with perhaps what some Ukrainians perceived as their interest, but not others. Many in Ukraine traded with Russia, and so forth. That resulted ultimately in what many have called a coup d’état against the Ukrainian government. Since then Ukraine has been in a state of conflict within itself, between many of the Russian-speaking population in the East and others. It was also with Crimea, there really was a vote, where the majority of people wanted then to join with Russia again, where they had been for a long time until a few decades ago. I don’t see that the resolution of those conflicts, or any of these conflicts, can be achieved by the rattling of sabers, which is how the German Foreign Minister Frank-Walter Steinmeier characterized this kind of military exercise last summer. He was very concerned about it, and now they are increasing the level of military exercises. It is a huge exercise unprecedented since the end of the Cold War. RT: Jens Stoltenberg said on Tuesday that one has to talk with Russia from a position of strength. How productive is that? Also, the Defense Secretary that Trump chose, James Mattis, and his Secretary of State Rex Tillerson both supported NATO in their confirmation hearings in the US Senate. So I would like to see President Trump take the lead here if he really wants to pursue negotiations with Russia and reduce this kind of military activity - it is not helpful. RT: Stoltenberg also said: “We don’t want confrontation [with Russia]; we don’t want a new Cold War.” Is that the impression you have when you take a look at NATO promo videos from on the ground? ER: No, that is not the impression at all. I am old enough to remember the Cuban Missile Crisis when the US government was appalled that there were missiles stationed in Cuba. I can’t imagine what most of us in the US would think if there were military exercises, say of Russia and China on the border between Mexico and Texas, on this scale. Of course, it appears aggressive to people in Russia, and it is not the way to peace. The way to peace is negotiation and to include Russia in the security plans for Europe, not to make those plans against Russia, but with Russia. RT: What impact do these war games and rotational deployments have on the security situation in Europe? ER: Well, I think they have a very negative impact in particular actually in those countries that are nearer to the Russian border. Any error, many things could happen that could lead out of these exercises to a real conflict. But the security of all of Europe is threatened, and this is one reason why so many people in Germany are hopeful that there will be peace made with Russia and are very fearful that a war could develop out these kinds of exercises, which seems to indicate a willingness to go to war by the US and NATO, unfortunately.